Infection Control & Hospital Epidemiology publishes scientifically authoritative, clinically applicable, peer-reviewed research on control and evaluation of the transmission of pathogens in healthcare institutions and on the use of epidemiological principles and methods to evaluate and improve the delivery of care. Major topics covered include infection control practices, surveillance, cost-benefit analyses, resource use, occupational health, and regulatory issues. 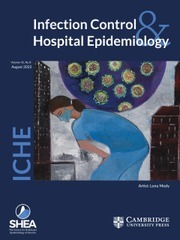 ICHE is the official publication of the Society for Healthcare Epidemiology of America (SHEA).